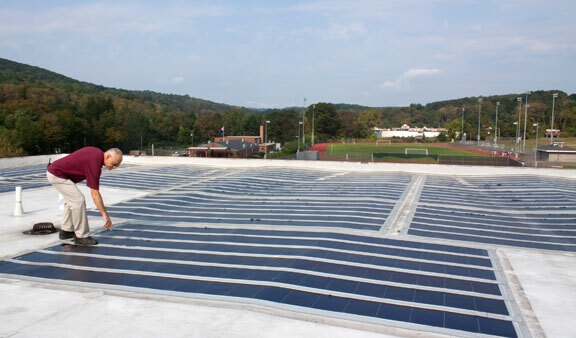 NAUGATUCK — A catastrophic failure of the solar panels built into Naugatuck High School’s roof has the borough looking at a costly, emergency project to replace the roof just nine years after it was put on the school. Mayor N. Warren “Pete” Hess said school officials noticed a few months ago that the solar panels weren’t generating electricity to the power gird like they were supposed to. A closer inspection revealed that the system had not only failed, but was actually creating a dangerous situation that could potentially damage the building, he said. The school district disconnected the solar panels, but they continue to generate electricity, making the roof unsafe and increasing the possibility of starting fire, Hess said. The Board of Mayor and Burgesses discussed the situation during a March 27 special meeting. Since the panels and electrical components are part of the roof, the panels simply can’t just be removed, Hess said. The panels themselves take up the majority of the space on the roof, he added. The photovoltaic solar panels are thin and affixed directly to the roof with the electrical components built into the roof, Burgess Robert Neth said. “You can’t dismantle the system without taking down the roof, which necessitates the construction of a new roof,” Hess said. Neth said officials considered a number of solutions, including disconnecting the panels and painting the panels black to stop them from absorbing the sun’s rays, before determining the entire roof had to be replaced. None of the solutions were enough of a fix to ensure the roof would be determined safe by the building inspector and fire marshal, Neth said. Messages left with the building inspector and fire marshal’s offices seeking comment weren’t returned. Voters approved the project to replace the roof, including adding the solar panels, at a referendum in 2007. Work to replace the roof started in 2008, and the solar panels were turned on in early 2009. At the time, the roof was nearly 40 years old. The project cost $5.9 million, and all but $1.2 million was paid for through state reimbursement and a grant from the state’s Clean Energy Fund. “At that time, we also thought it would be nice to do some solar, to be green,” said Neth, adding state officials highly recommended the technology because it seemed so promising. 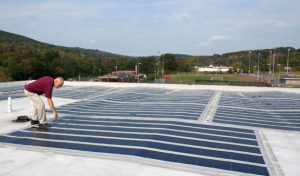 Once the project was completed the state recognized it for being the largest solar project on a municipal building, Neth said. The panels, which were expected to last for 25 to 30 years, worked well at first. Over the first two years, the borough saved about $180,000 in electricity costs, according to Republican-American archives. Neth said officials used the best possible information they had at the time when deciding to move forward with the solar panels. “At the time, [the solar panels] weren’t failing. How are you going to know? Things happen unfortunately. It is disappointing and discouraging,” Neth said. Hess believes the cost to replace the entire roof will be around $5 million, though officials haven’t gone out to bid or received any solid numbers yet. Hess said borough officials reached out to the state about possible reimbursement for the project. However, the borough is facing an uphill battle since the roof is less than a decade old. “Normally we would be entitled to 75 percent reimbursement for a roof-replacement project. This roof has been in place nine years and it is supposed to go at least 20,” Hess said. Hess said he’s argued the borough should get at least some reimbursement for the nine years that the roof has been in place. The borough also wanted to go after Solar Integrated Technologies, the California-based company that created the solar panels, for the cost of the new roof, Hess said. However, the company went bankrupt in 2015, according to a report by the financial media company Bloomberg. “It looks like we have no legal remedies,” Hess said. The borough is also looking at the possibility of filing an insurance claim to recoup some of the cost of a new roof, Hess said. Burgess Rocky Vitale, who worked at The Harford Insurance Company for many years, said the borough shouldn’t bet on receiving any insurance money and that the solar panels failing would likely not be covered under the borough’s insurance. The lack of options could leave the borough on the hook for the total amount of the replacement. Hess said the borough is exploring its options, including bonding or purchasing a roof on a lease-to-own plan. As much as the borough would like to take its time to ensure the best price and any possible reimbursement, officials are facing a ticking clock, Hess said. Hess said the work will likely need to be done over the summer break, which leaves only a few months to send the project out to bid and figure out how to pay for it. “Right now we have about six or seven balls up in the air and we are trying to put everything together to get the best result we can,” Hess said. Hess said the borough will be able to move the project forward without a referendum vote because the replacement is an emergency. Sounds like your talking about the leadership in Beacon Falls. Thin panels were NOT the way to go. Poor choice by our elected official. Poor poor choice! Company relied too much on foreign profits, that failed. A company stabilization study would of shown this! How are the thin panels doing on the Plainville high school doing? Same bad choice made by non- technical ego driven officials. Naugatuck needs an Engineering making these big ticket item decisions. Another reason why we have a 49 mill rate. Poor decision after poor decision!